Amazon has recently released its two breakthrough products in the market, namely Amazon Fire TV and Amazon Fire Stick. Now, both of these products are a new generation smart TVs which are equipped with the capabilities to access internet and operate various popular apps. 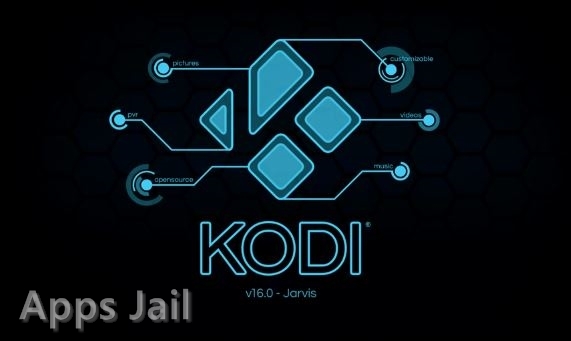 KODI is one such popular app which can be installed on Fire Stick and used for watching all the premium TV shows, movies, etc for free. But, lately I’ve seen that many people are facing problems while installing KODI on Fire Stick. Those who succeed, have used a PC during the process which made the process quite troublesome. Hence, I decided to come up with a guide and answer the question of how to install KODI on Fire Stick without PC. 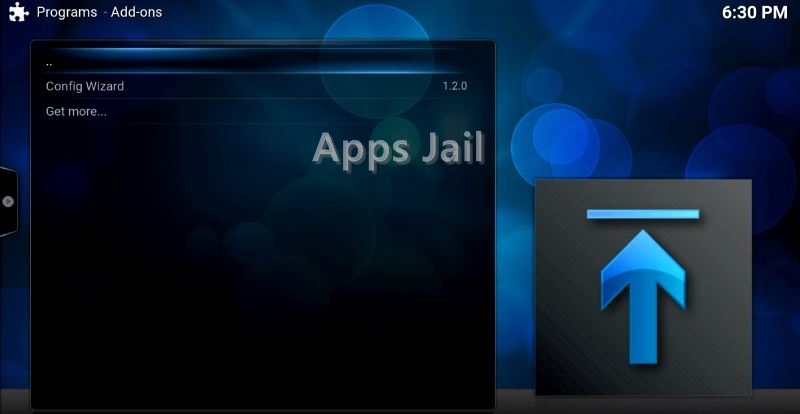 2.0.1 Also See: How To Jailbreak Roku Streaming Stick? 3.0.1 Also See: How To Put Kodi On Roku? 6.0.1 Also See: How To Fix Exodus Errors? In this article, we will guide you through a complete guide to install KODI on Fire Stick without using PC. Now, we believe in providing quality to our readers. Therefore, we will suggest you guys a couple of apps like Fire Starter, to enhance your experience while using KODI on Fire Stick. This is only to help you through the process of installing KODI on Fire Stick and also make your experience there after smooth. So let us begin with the installation of KODI on Fire Stick without PC. Done with the installation of KODI on firestick? Must check out our guide on How To Use KODI On Firestick! Before we start installing the KODI, we need to make sure that our Fire Stick is ready for all the tasks that we are going to perform. So, follow the steps below to configure the Fire Stick. In the main menu of Fire Stick, go to “Settings“. Under Settings, move on to System. Now at the bottom of the list, there will be “Developer Options“. In the “Developer Options”, you need to make sure that ADB Debugging, USB Debugging and apps from unknown, all the three of them are switched on. Also, make sure that Fire Stick is connected to a WiFi network. Well, you might think why we are making you install ES Explorer in Fire Stick. To answer this, ES Explorer will help us to carry out some tasks which will eventually take us to our destination, i.e. installing KODI on Fire Stick without PC. Please follow all the steps carefully and use the images for assistance. We have also embedded a video at the end of this page to give you a clear guidance. 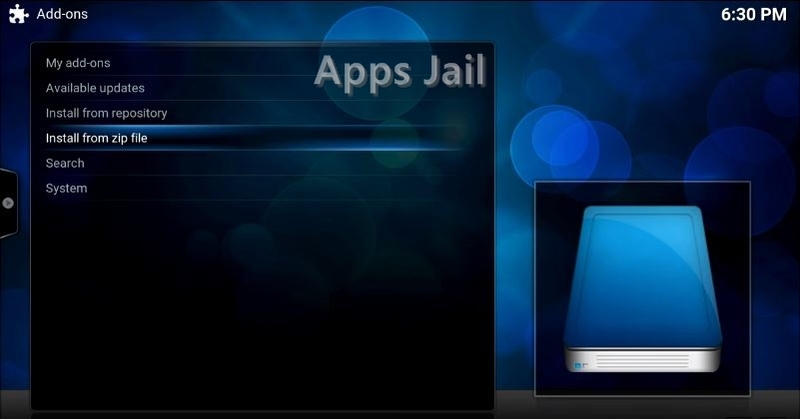 Also See: How To Jailbreak Roku Streaming Stick? In the results, the very first app with the blue icon will be ES Explorer that we are looking for. 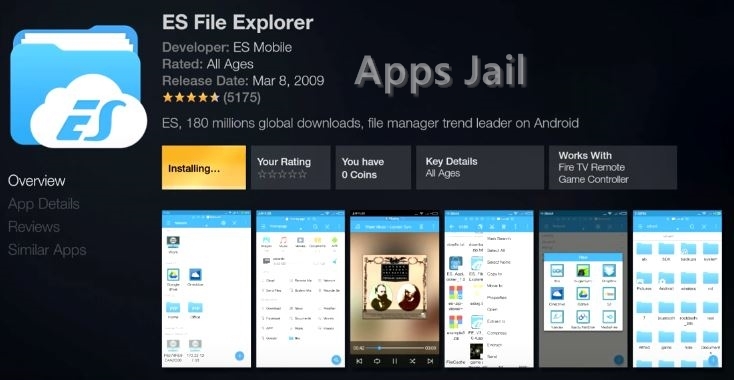 Download and install the ES Explorer. Open the ES Explorer app once it’s installed successfully. Now that we are done with the installation of ES Explorer, we shall kick off the actually process to install KODI on Fire Stick without PC. So now we will use ES Explorer in place of a PC to install KODI on Fire Stick. In the left sidebar of ES Explorer, you will see “Favorites“. Expand the “Favorites” and click “Add“. Under path, type this “http://www.kodi.tv“. You can name it anything you like. For Eg: Kodi. Now click “OK” and a bookmark named Kodi or whatever you entered will be added. Open the bookmarks we just created. Now, we will have to browse through the webpage which will open when you click the bookmark. We are actually looking forward to download KODI app from the official website of KODI. I know that you’ll be using a remote for this. So just a tip from our side, use left and right arrows to navigate through the webpage. Navigate to the webpage using arrow keys. Reach the “Download” button and click it. 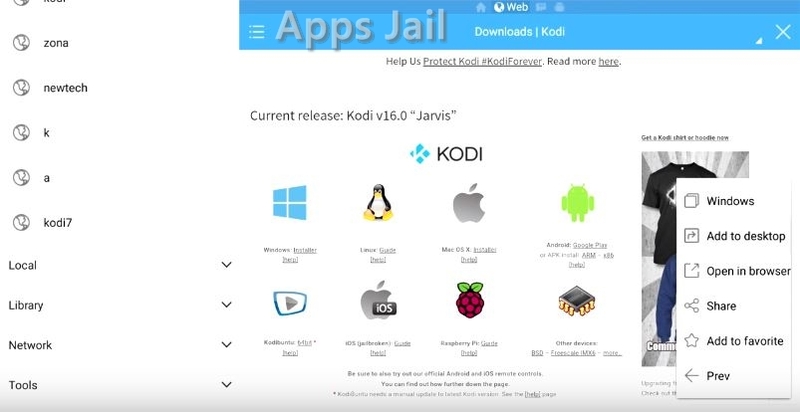 You will see many versions of KODI listed there. Using the remote, go to the Android version. Below the Android icon, click on “ARM“. Now nothing will happen, and that’s completely fine. Once you’ve clicked the “ARM” button, navigate to the “More” option which you will see in the lower right bottom of the screen. This will start the KODI APK download. The KODI download will get completed and it will be installed automatically. 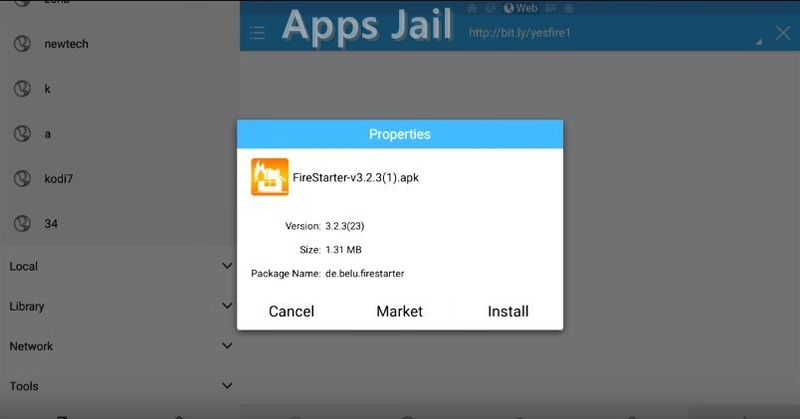 But right now, we are going to install another app called Fire Starter which we mentioned before. Fire Starter basically segregates the apps and keeps them in separate folder which makes it easy to access. Though it is recommended that you install Fire Starter, if you wish not to, skip this part. Open the ES Explorer again and add a favorite just like we did earlier. In the path, type “http://www.bit.ly/yesfire1“. Name it anything you like. Now open the bookmark from the left sidebar. Nothing will open. Don’t panic. You need to move to “More” option like we did previously. This will trigger the Fire Starter Download. Let the download finish and then Fire Starter will automatically get installed. When you open it, you’ll see how graciously the app icons are placed and how easily you can access them. So now that you have installed Fire Starter, lets move on to install add ons in KODI to make it more useful and meaningful for us. Related Articles What Is Roku? How Does Roku Work? Open KODI app in Fire Stick. Navigate to “System” and select “File Manager” in that. Now you will see two options, select “Add Source“. In the path type this, “http://www.fusion.tvaddons.ag“. Give the source a name. Any you wish. Now go back to System and select Settings in it. Under settings go to Add Ons. Select “Install From Zip File“. You will see that the Source you just created is available there. Select the source and click “Start Here” under that. The Add On installation will start. We shall now configure the Fusion Add On. So in the KODI main menu, go to “Programs“. Under that go to “Program Add Ons” and select “Config Wizard“. You will see a lot of options in there. Select Android from the options. This will initiate the configuration of Fusion on KODI. That’s it my friend. Now we are completely done with the installation of KODI on Fire Stick. 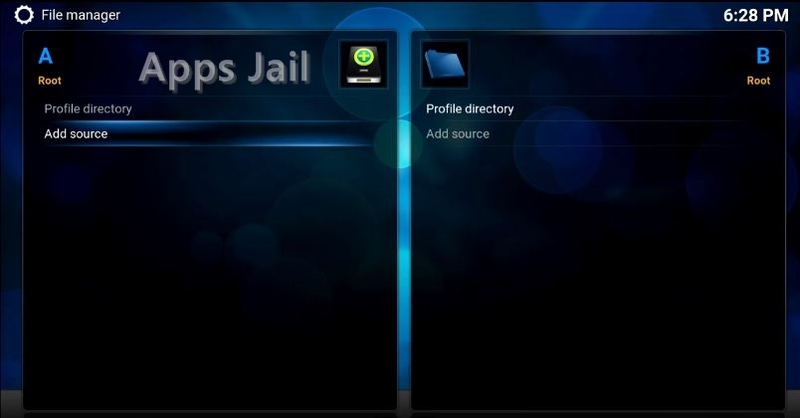 If you visit the videos and music section of the KODI, a lot of channels will be available for you. You can stream through each of them, watch many premium TV shows, TV series and other stuff which is absolutely free of cost. I hope you were able to follow the steps to install KODI on Fire Stick without PC. In any case you’ve missed any point, and landed up in a trouble please comment your problem below. We will try our best to solve the issue for you. Also See: How To Fix Exodus Errors? Look. I registered the device. I’ve followed all of the steps, but when I put in a search for ES Explorer, let alone anything else, it tells me that there is an ‘error’ and that I should contact customer support. I can’t help but to think that doing so wouldn’t be very conducive to the success of what I’m trying to do. My wireless connection is good and stable. Naturally, I’ve registered the device, but it still tells me that it is unable to connect to their network. It puts on a fantastic screensaver, allows me to download apps, but other than allowing me to access the menu options, I cannot go any further. Can someone please help or provide me with some suggestions. Hi, does it provide any additional information about the error or just says ‘error’?